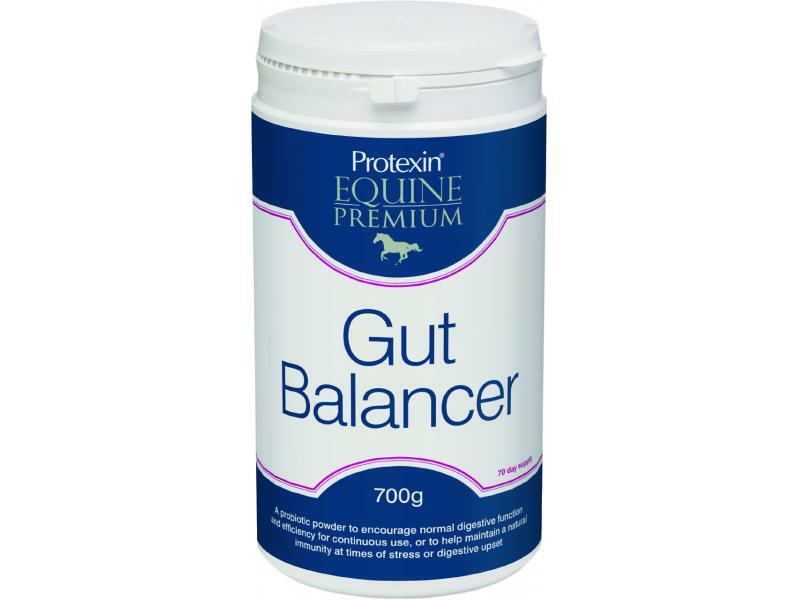 Promoting normal digestive function, Protexin Gut Balancer is a palatable prebiotic and probiotic powder that can be used either continuously or simply in times of high stress or digestive upset to restore the natural gut balance. 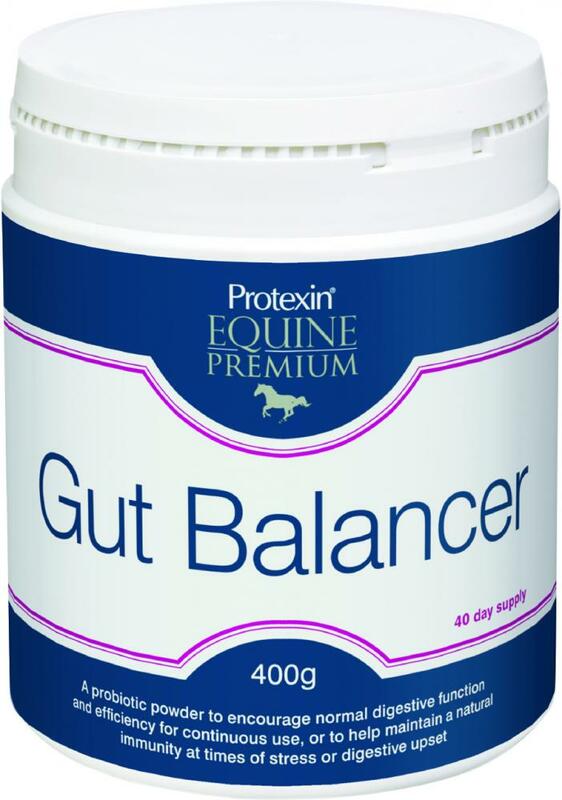 Protexin Gut Balancer has also taken over from Protexin Bio-Premium. Alfalfa meal, Preplex® prebiotic (Fructo-oligosaccharide), Brewer's yeast. Digestibility Enhancers - Protexin probiotic. Preplex® prebiotic - Acacia (Gum arabic). 5 - 10g (1/2 - 1 level measure) added to the daily food. 10 - 20g (1 - 2 level measures) added to the daily food. 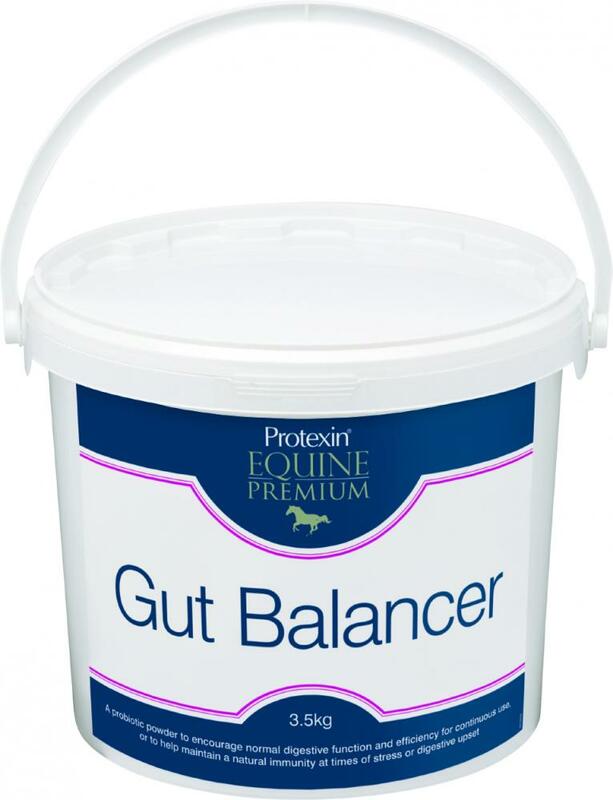 Below are some recent questions we've received regarding Protexin Gut Balancer (Bio-Premium) for Horses, including answers from our team. If I feed 10g twice a day, the 7kg would last a year, is the expiry longer than that? If i feed two scoops of this a day, how long will a 700kg tub last for? I.e how big are the scoops? A scoop is 10g so at a rate of 2 scoops a day the 700g tub would last 35 days and the 7kg tub would last 350 days. I already feed acid ease, can you tell me what the difference is in product? I think my horse has a hind gut issue. I'm also already feeding yeasacc. Anything else you could recommend? Acid Ease acts to protect and soothe the gut lining where the Gut Balancer will help restore the normal balance of microbes in the gut. 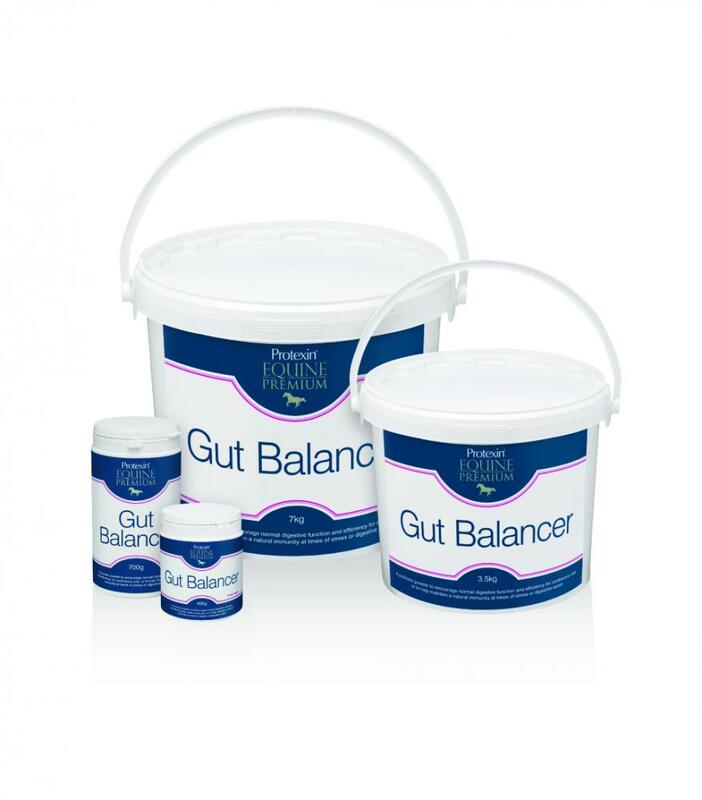 This balance is very important to maintain efficient digestion and absorption of nutrients. Gut Balancer is the product I would recommend if you are concerned about hind gut issues. You can safely feed this alongside Acid Ease. My horse has been noted to be eating poo - he's turned out 24/7 and given extra haylage over the past couple of months through the winter with 2 small hard feeds a day. Would this be worth trying as the poo eating suggests maybe some gut issues? 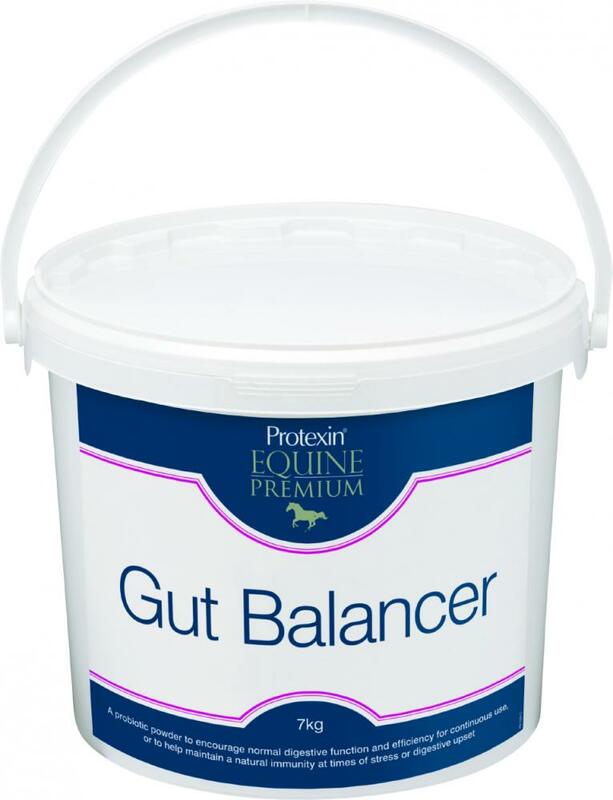 Good bacteria in the hind gut of a horse help to break down food, manufacture certain essential vitamins and keep "bad bacteria" at bay. 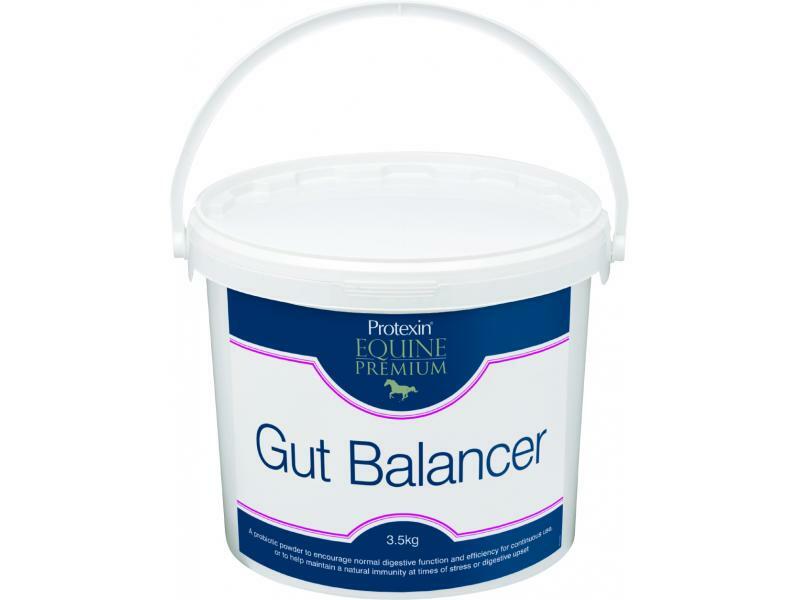 If the hind gut has gone into dysbiosis and the balance of good bacteria to bad bacteria has been compromised you are right that a horse may eat poo to re-establish the correct balance of bacteria in the gut. Of course there are exceptions to this rule but using a probiotic is a good place to start. Protexin Gut Balancer would be the ideal product to use here so I would certainly give it a try. Horse is on haylage and has solid pooh but lots of liquid comes out at the end. Her bum is very dirty. Will this help settle her? Yes, probiotics such as this should help to firm up her droppings. You could also try feeding a mixture of hay and haylage so that the forage she is getting is not so rich. This would also be better for her teeth since some horses can be prone to developing peripheral caries on haylage only. My daughters pony is becoming more grumpy and sensitive when brushing his underneath, girthing up and when ridden when riders legs are on him. He's recently started to do a little buck occasionally when legs go on. We've had him over a year and he's always been fine. His belly looks bloaty , although his droppings are fine. He's also grinding his teeth on door which is a new behaviour. He's turned out in day, in at night and has good diet. He's competing most weekends and all his tack etc fine. Wondering if he could have a sensitive Tummy and if this product could help? 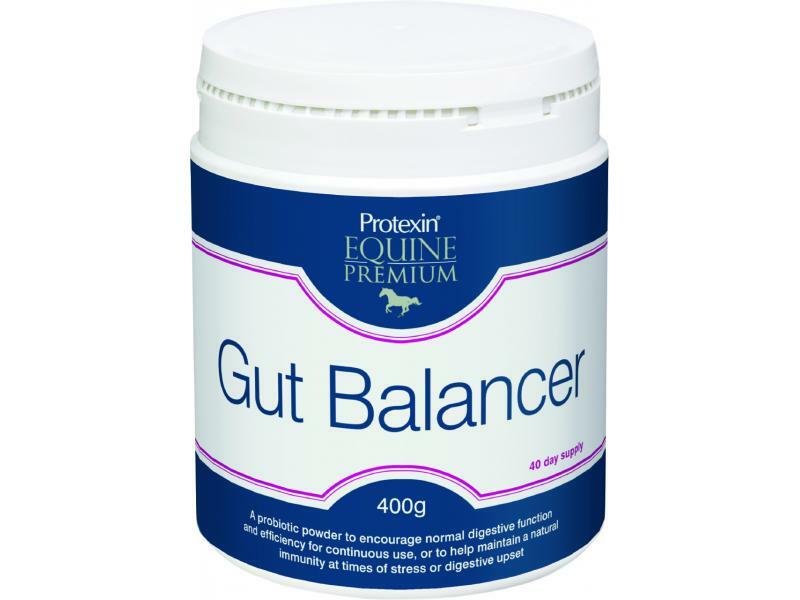 It is possible that he has an uncomfortable abdomen due to a digestive condition and that this product will help. However it is too difficult for me to say how likely this is. There might be many other reasons for the observations you have made and they might well need a different treatment. Ideally you need a good horse vet to spend some time examining him and perhaps do some faecal tests to try to establish what is wrong. There will be no harm trying this product, but it might not help. My mare has a nasty habit of ending up with a bloaty tummy throughout the spring and summer months (even though I restrict her grazing). I use this on my spasmodic colicer, it works wonders for him; is it worth putting her on it too? It sounds as if this would be well worth a try for this horse. There is a good chance that it will help. This should be fine to use in a horse prone to laminitis. It should have no effect on laminitis. Shelf life for larger quantities. Hello, I've noticed a previous reply stating the shelf life once opened for this product is 28 days. Could you please advise me if this differs for the larger quantities you sell, as otherwise they will be a waste of money. Thank you. The 28 day rule will not apply to this product. There is a general guideline that all medical products sold in sealed containers are used up within 28 days from breaking the manufacturer's seal on the packaging. However this is not sold in hermetically sealed containers, so potentially the shelf life is given by the use-by date on the package (generally 2 years from manufacture). This would depend on you keeping it dry and preventing excess contamination with anything when you open and use it. We have a Bearded Collie with exocrine Pancreatic Insufficiency. We have been advised to give pre and probiotics. would this product be suitable for dogs and if so how much would the daily allowance be please? This is the wrong product for a dog and it would not be appropriate. I would suggest Pro-kolin Enterogenic, which is much better for dogs and can certainly help in the management of EPI.